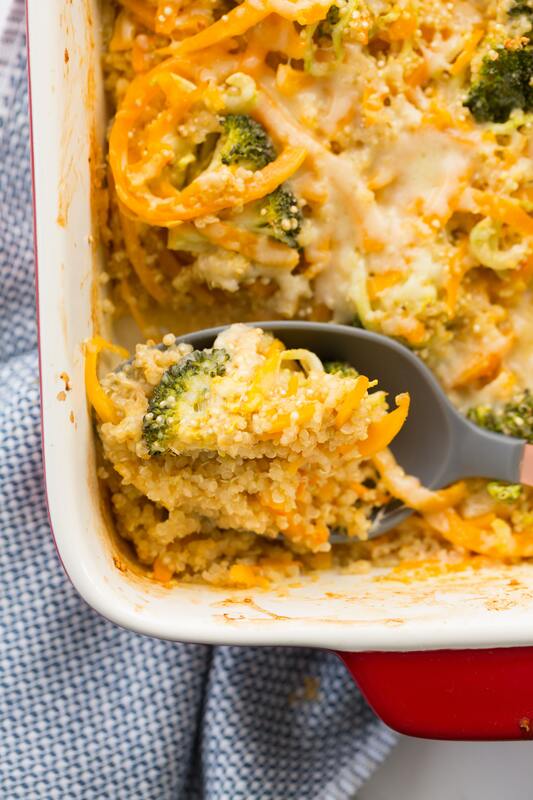 A gluten-free one pan casserole dish packed with veggies and cheesy flavor, using spiralized broccoli stems and florets, spiralized butternut squash, and fluffy quinoa for a healthy, filling one pan casserole. Over the weekend, I got into full on fall season mode (which is ironic, because it was pretty warm this weekend.) We went apple picking with my brother and sister in law and their 3.5 year old daughter – and my grandmother! It was just one of those feel good weekends when you’re just so grateful for family and your health. The news has been a scary place lately and sometimes, when you spend too much time reading the news, watching the news and scrolling through Twitter, you get caught up in it and think that the world is a sad, negative place. But it really isn’t- there is so much to look forward to, to celebrate, to love, and to enjoy. Like, spending the afternoon picking apples and on a hayride. Last week, I made this casserole, because it was a little chilly and I was craving fall coziness. 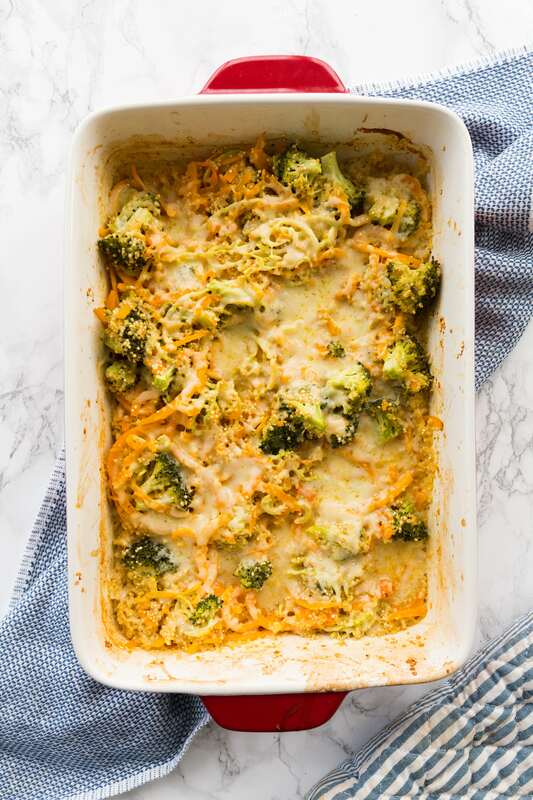 I had broccoli and butternut squash in the house and wanted to make something to have in the fridge over the weekend and this recipe was born. I’ve been wanting to make a raw quinoa casserole and I finally did it. It’s so easy! You just add enough liquid for the quinoa to cook in the oven (quinoa cooks in a 2 to 1 ratio), cover it, and let it steam and cook. This meal is so flavorful and if you want to add a meat-y protein for your meat lovers out there, cook some ground turkey and add in there before you melt the cheese on top! Luca loved this (you can see how I served it to him here.) Anyway, expect more fall recipes, because I’m in the spirit! Preheat the oven to 375 degrees. Grease a casserole dish with cooking spray. 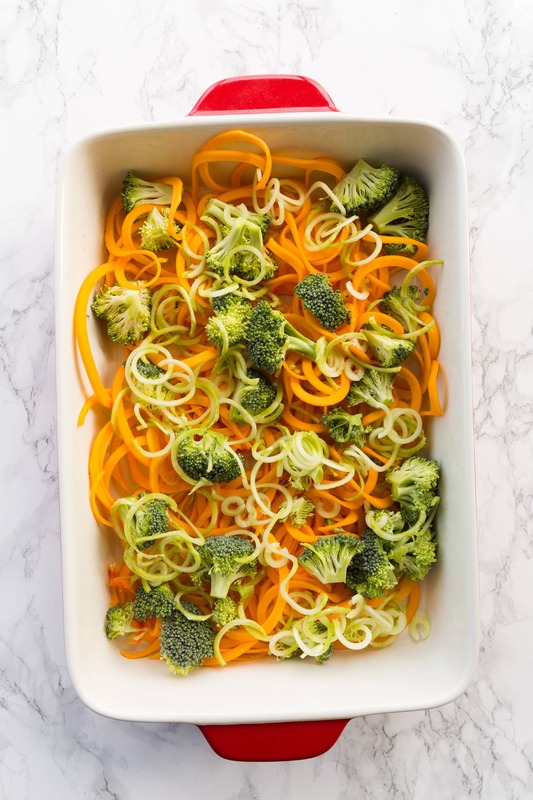 Place the butternut squash noodles and broccoli (florets and spiralized stems, if using) in the casserole dish and sprinkle evenly over with quinoa. Set aside. In a medium saucepan, whisk together the chicken broth and milk over medium-high heat. Once heated, add half of the cheese and whisk until the cheese melts. 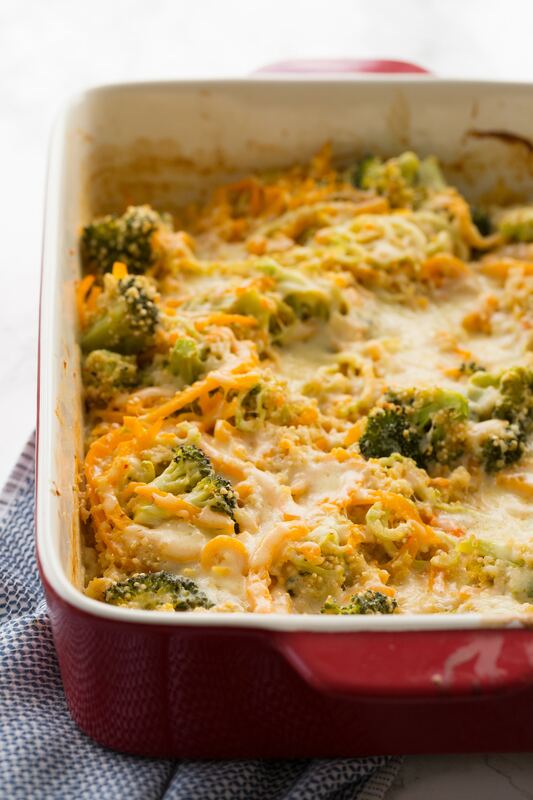 Remove from heat and pour the cheese mixture evenly over the vegetables in the casserole dish and season with garlic powder, onion powder, red pepper flakes, and salt and pepper. Stir together to combine. Cover the casserole dish with foil and bake in the oven for 30 minutes at 375 degrees. Remove from the oven, stir, and sprinkle over the remaining cheese and cook uncovered for 10 minutes or until cheese melts. Oh this sounds so good! I am adding this to my menu for this week. I have done a macaroni and cheese casserole with broccoli and chopped ham (great for post holiday meals) and topped with sliced Roma tomatoes, and hubby asked if I could do that with this. I am going to give that a try this week! I like that there are only 32 carbs a serving, since I am carb counting and I can only have 45 a meal and our family has missed 'mac n cheese'. Hi Karen! Hope this was enjoyed by all! Is this meal freezer friendly? 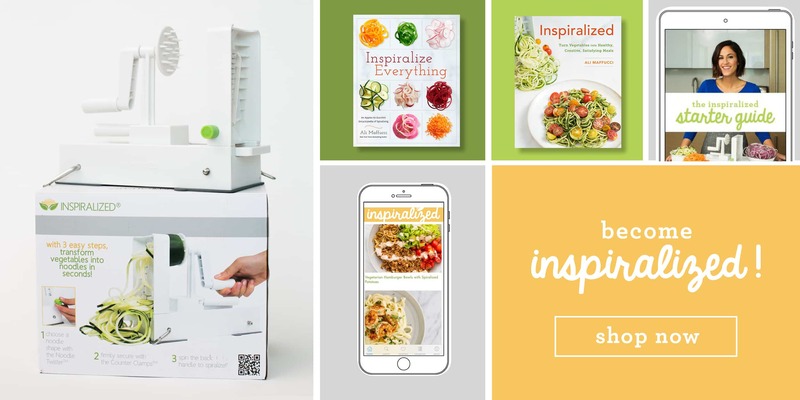 I'm due this month with my first child and my husband and I are looking for meals that we can make ahead of time and freeze. I’m curious about this too! I have a new baby coming in 2 weeks! Is it chicken broth, or vegetable broth? Veggie broth. Hope that helps! So.... I bought a sweet potato (orange/yam) instead of butternut squash.. :-| Does anyone think this will be good together (minus the quinoa)?? Just potato, broccoli and cheese??? I do! I love baked potatoes with broccoli and cheese sauce. It might be a little sweeter with the sweet potato, but I think it works still be good. Hi Pam! Yes this sounds great! Let us know how it turns out! Made this tonight but the quinoa didn’t cook. Had to bake an additional 25 minutes. Then the broccoli was over cooked. Any suggestions ? Good flavor in this recipe! If I make it again, I would add the quinoa to the bottom of the dish before the veggies to ensure it cooks evenly. Stirring was difficult in a full dish before the veggies had a chance to cook down! I also added the spices in to the liquid to ensure they were evenly mixed throughout. Enjoyed this one! We love this recipe! The only thing we do differently is put the quinoa in first so it's all at the bottom and stays in the liquid and is nice and cooked evenly. When we sprinkled it on top, we had crunchy bits here and there. Thanks!